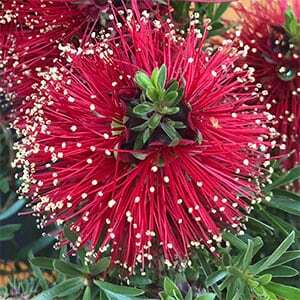 With brilliant red flowers that attract birds and bees to the garden, Kunzea baxteri also works well as screening plant. This is and easy to prune native plant, so you could also use it as an informal hedge or barrier plant. The flowers are typical ‘bottlebrush type’, compact and appearing in masses. Like many Western Australian plants, the Crimson Kunzea is best planted in a position where it receives good air flow and relatively low humidity. Once established this is very easy care. Mulch around the plant to maintain a cool moist root run. Provide some water through the first summer and thats about it. The time two prune is directly after flowering. It is best to prune regularly rather than cut back hard. Best grown in full sun or just little afternoon shade. Deep shade is not suitable as it may encourage scale and fungal problems. Water well when first planting and provide some moisture through the first summer. A general purpose native plant fertiliser applied once a year in spring should be adequate. Propagated from cuttings, also possible from seed. Cuttings are best taken in late spring to summer. Botanical Name – Kunzea baxteri. Spread – Forms a clump to around 2 – 4 metres.